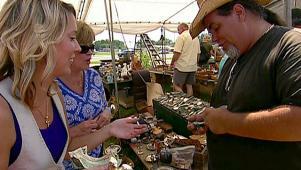 Three teams of shoppers have two days and $500 to shop till they drop at the world's longest yard sale. Their mission is to seek out all the items they need to complete a room makeover in their homes. Along the way, there will be challenges which will grant the winning teams additional spending cash. Host Steven Lee keeps us posted on their progress, and antiques expert Elyse Luray will advise and guide our teams as they haggle with the pros. In the end, the smartest shoppers will win an extra $1000 cash. The Route 127 Yard Sale starts in Ohio and finishes in Alabama, taking us through Kentucky, Tennessee and Georgia along the way. That's 654 miles of steals and deals! The three teams race to complete their last Endless Yard Sale challenge. The three competing teams comparison shop at the Endless Yard Sale. 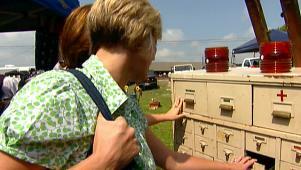 Teams try to find the best item at the best price at the Endless Yard Sale. Elyse and Steven help the two underdog teams shop at the Endless Yard Sale. The teams show off their makeovers and Elyse and Steven reveal the winners. Elyse Luray appraises the teams' finds at the Endless Yard Sale. 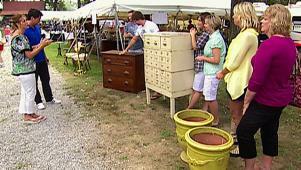 The three competing teams hunt for bargains at the Endless Yard Sale.